I’d read about but didn’t understand SAAM’s “Ghosts of a Chance” until now. Can’t say that we’ll do an ARG but Georgina Goodlander’s enthusiasm is infectious and the programming that’s happening as a result of goac is something to emulate. Group activities, family and school programs, sms combined with looking at art = serious time spent at museums, fun, and engagement. “Fancy a cuppa?” Read her paper and play a sample game by sending the text message ‘goac black’ to 95495. WolfQuest is a 3D wildlife simulation game developed by Eduweb and the Minnesota Zoo. Dave Schaller and Kate Haley Goldman reported on the evaluation, incomplete but three-fourths baked. The great thing about this evaluation is the sheer volume of data, no statistically insignificant results here. This is one of those rare instances where follow-up interviews with surveyed users reveals whether they actually did what they said they would as a result playing the game (e.g., lookup info about wolves on the Internet, make art related to wolves, visit a zoo). An unfortunate truth is we only do evaluation where funding requires it, and we rarely get the information needed to truly inform new versions or future initiatives. This project proves otherwise. 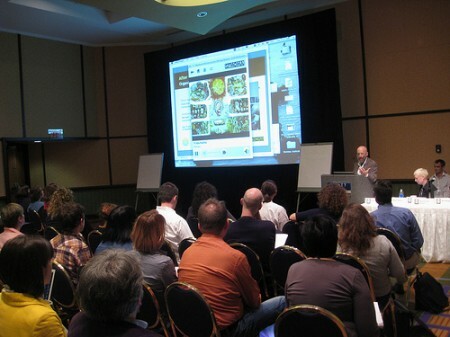 Twitter was the talk and technology of the conference. MW2009 was among Twitter’s top 10 trending topics, even claiming #1 on Friday. I will admit to not liking the Twitterfall on screen during the opening plenary—too much of a distraction—BUT the conference vibe and distillation of what people were thinking, feeling, seeing as evidenced on Twitter was amazing. Reading the topic feed provided entry into sessions that I hadn’t been able to attend and helped me select must-read papers for the flight home. From Max Anderson’s opening keynote “Moving from Virtual to Visceral” and the generous sharing of information about cloud computing and ArtBabble to the Friday night reception and chance to wander the gardens and galleries, the Indianapolis Museum of Art set a high bar for local hosts. IMA is reason enough to come back to Indy (that and the Children’s Museum which I didn’t get to). Also, must say I loved the airport: small, clean, pretty with all the amenities (ample Starbucks, free WiFi) and I could check-in with an electronic boarding pass on my phone. The Walker’s My Yard Our Message won best of the web in the innovation category. For a team that’s been feeling like it lost the “new” in media during the long ArtsConnectEd development effort, this was nice. But the big winner was Brooklyn, who took top honors for exhibition (Click! A-Crowd Curated Exhibition), on-line community or service (Brooklyn Museum Collection, Posse, and Tag! You are It! ), and best overall site (brooklynmuseum.org). Sadly, the award coincided with the museum’s announcement of cost-saving measures in response to economic challenges. Among these actions, a moratorium on staff travel, which meant no one from Brooklyn attended the conference. Instead they sent a video acceptance speech thanking their director, team members + dogs, and above all the audience and participants that made it all possible. I was nearly in tears. Having been referred to as a “seasoned webster” in the conference Twitter stream, I resolve to stop expressing the feeling of being old. I have yet to figure out the reward for colleagues catching me in the act of “old” behavior but there will be one. Really, I’m not that old, I’ve just been in the game for more years than most M&W participants and … okay, I’m exhibiting old/been there behavior. Nina’s mantra—translate those digital experiences into the physical space of the museums—is something we’re trying to do at Walker in the upcoming reinstallation of the collection. She started her mini-workshop with the British comedy sketch “Facebook in Reality” (a must watch if you haven’t already http://www.youtube.com/watch?v=nrlSkU0TFLs) and then showed examples from Harrah’s gift card to the Bibliotheek Haarlem Oost book return/tagging exchange as examples of integrating technology into the visitor experience. Seemingly simple, great examples (read Nina’s paper), but oh so hard to do (as in coming up with the good idea). I’m still wrestling with her closing observations about the disconnect between IMA’s online and physical presence but her ideas are nonetheless aspirational. We got great feedback on ArtsConnectEd, just what we needed going into the May 4th public soft launch. We developed the content submission technology—collection records exported in CDWA Lite XML format and harvested with OAI-PMH—to support the future possibility of including other collections but weren’t prepared for the number of people asking how they could get their stuff into the repository. It all holds great promise but there are a few politics to work out on our end.